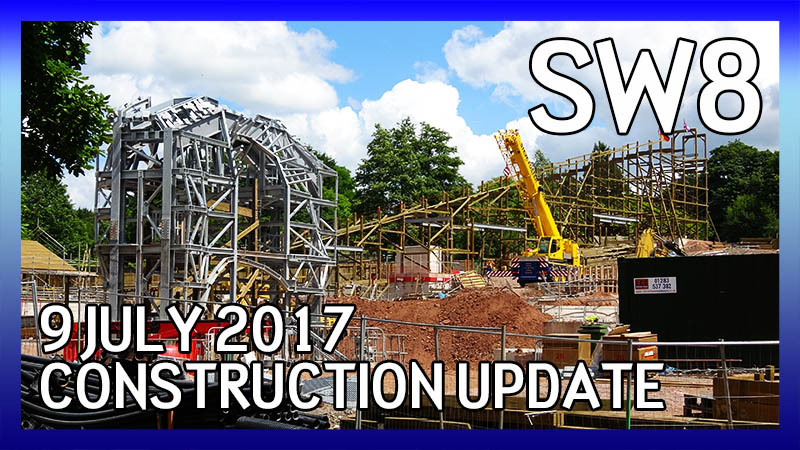 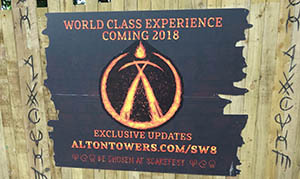 Wicker Man, codenamed SW8 (Secret Weapon 8) is Alton Towers' new wooden rollercoaster, built on the old log flume site and due to open for the 2018 season. 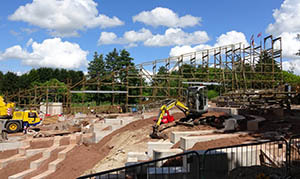 Wicker Man will be the park's first wooden rollercoaster when it opens at Alton Towers in 2018, and is being manufactured by Great Coasters International (GCI). 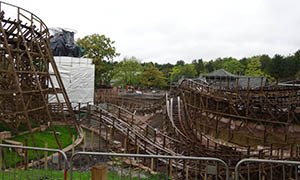 As is common with Alton Towers' rollercoasters, it was given the codename Secret Weapon 8 - SW8 for short - during construction. 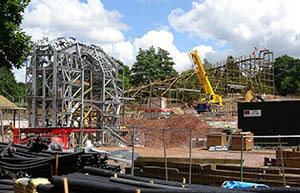 From early on, rumours suggested the ride would have a Wicker Man theme, and rollercoaster's track would pass through large Wicker Man statue. 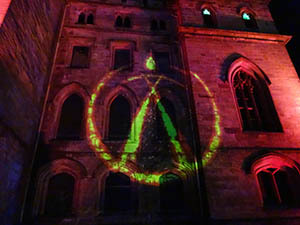 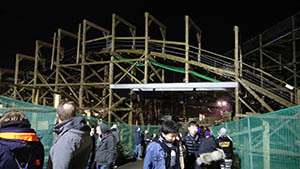 The name Wicker Man was officially confirmed at midnight on 8 January 2018. 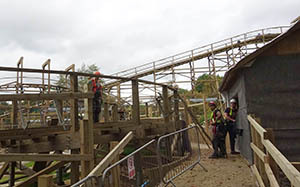 Planning for the ride began in 2014, with several areas of the park considered as possible sites. 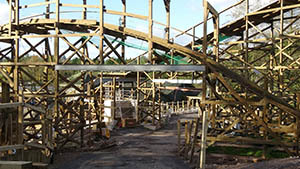 Early on, the rollercoaster was due to be part of Forbidden Valley, built on the car parks near to Air. 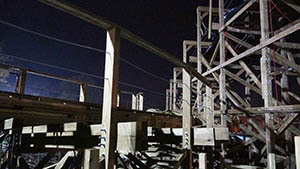 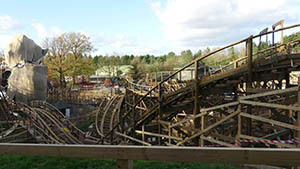 By March 2015, a location on the site of The Blade was being considered, with the track reaching over to part of the old Nemesis extended queueline. 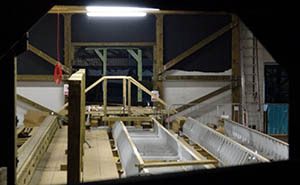 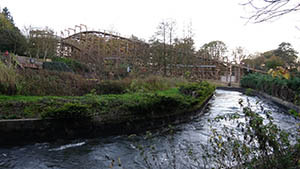 However, ultimately The Flume site was chosen after it was decided that the log flume had reached the end of its serviceable life. 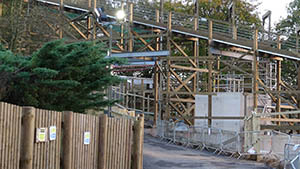 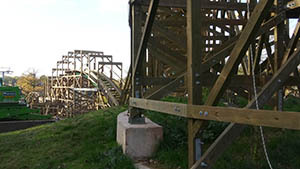 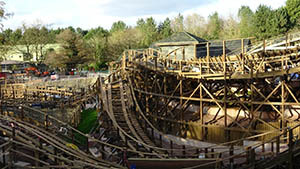 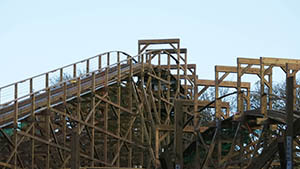 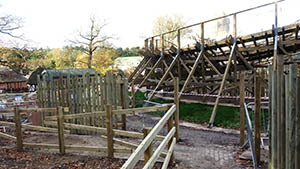 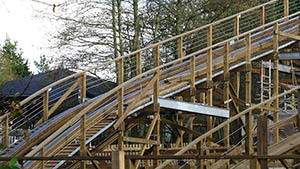 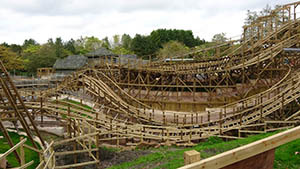 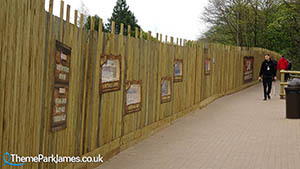 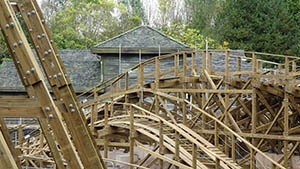 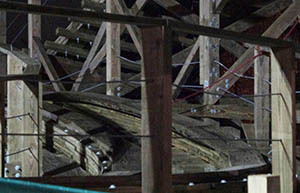 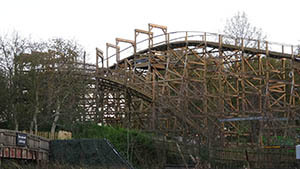 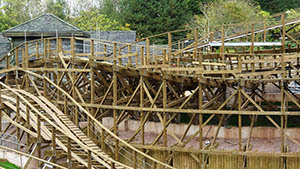 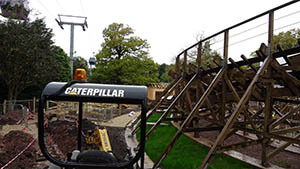 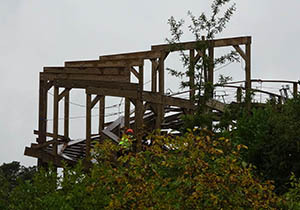 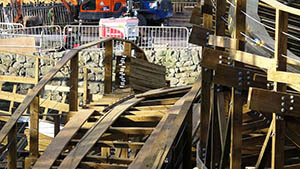 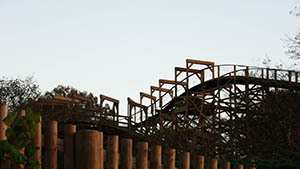 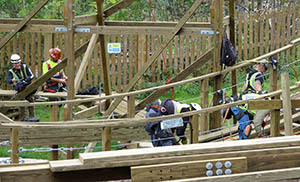 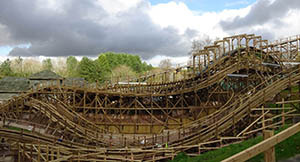 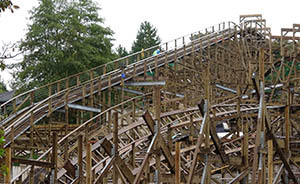 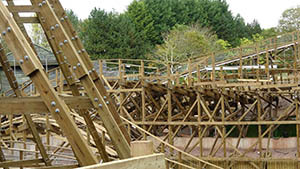 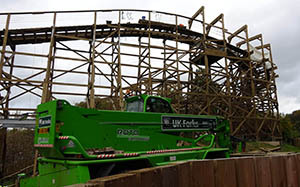 Several options for rollercoasters were considered and passed through focus groups, before the teams at Merlin and Alton Towers settled on a wooden rollercoaster. 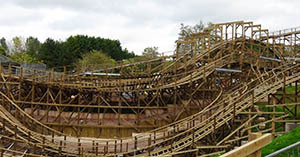 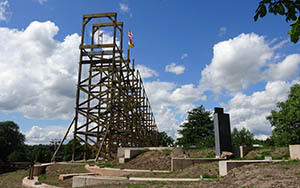 Proposals from manufacturers such as The Gravity Group (Cú Chulainn, Tayto Park) were evaluated before settling on the design from Great Coasters International (Wodan, Europa Park). 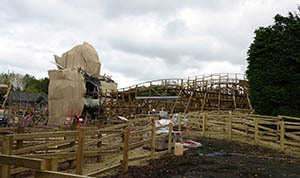 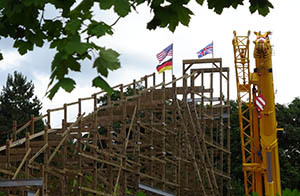 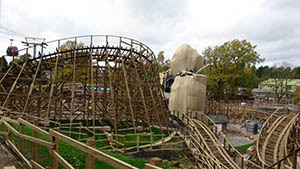 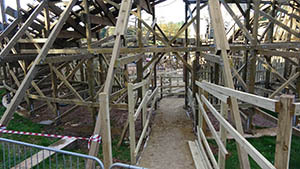 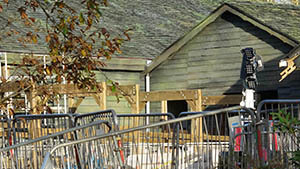 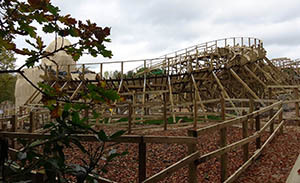 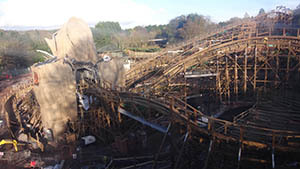 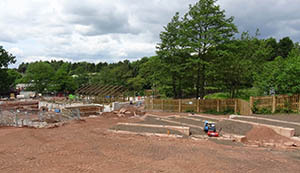 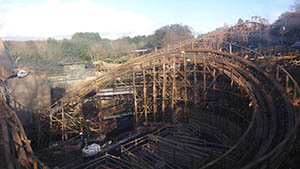 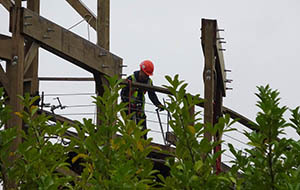 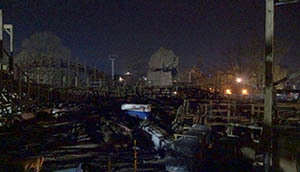 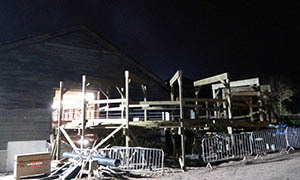 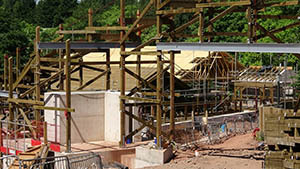 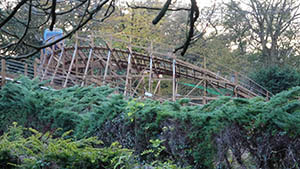 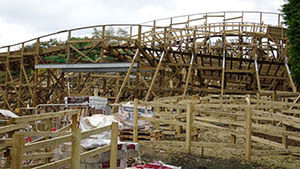 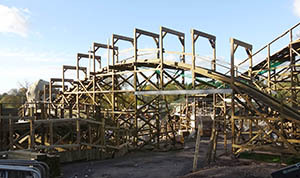 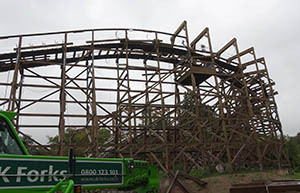 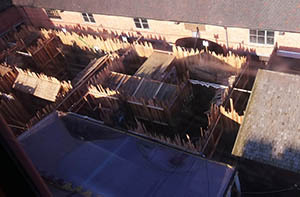 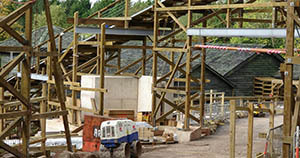 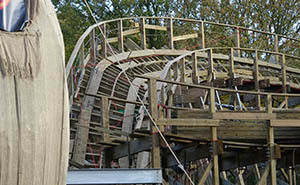 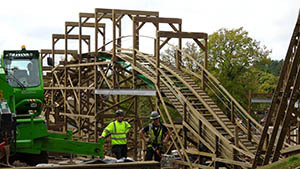 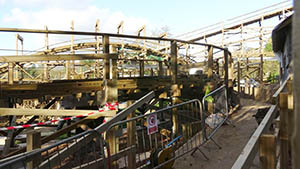 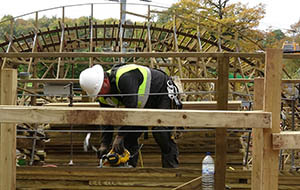 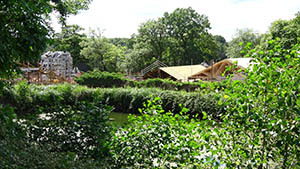 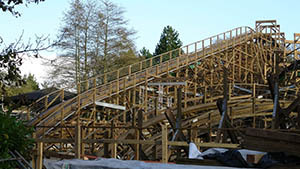 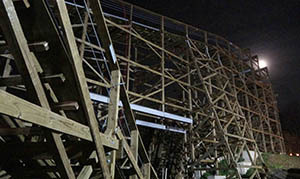 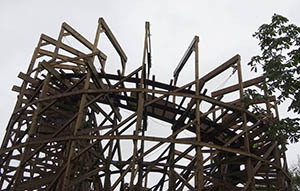 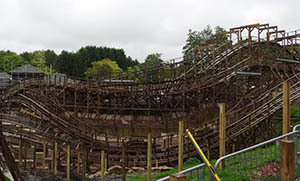 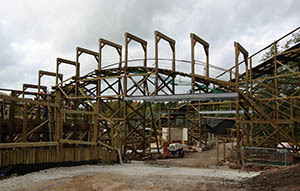 Much of Wicker Man's construction took place during the 2017 season, so visitors to the park were able to watch progress as the wood rose into the sky. 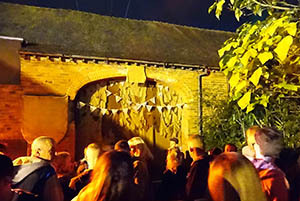 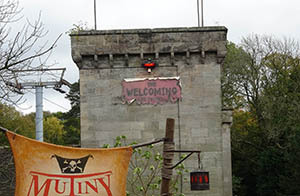 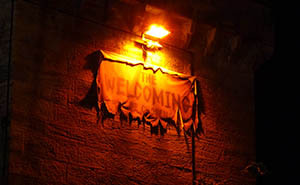 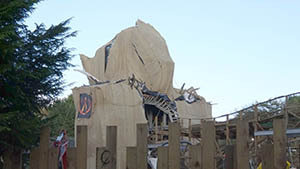 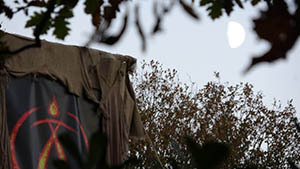 The Welcoming: Be Chosen was a new scare maze at 2017's Scarefest event, which hinted at Wicker Man's theme and acted as a prequel to the ride itself. 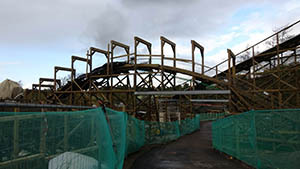 The first train was successfully sent around the track in December 2017. 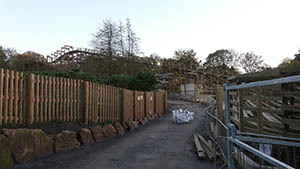 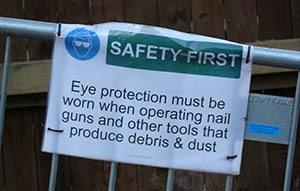 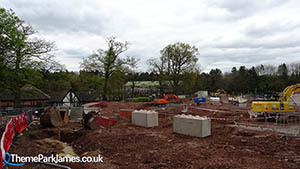 Alton Towers' fireworks weekend provided the final opportunity before the closed season to take a look through the fences at the SW8 construction site. 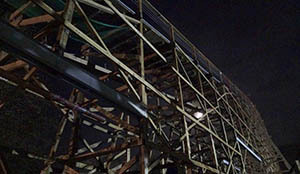 The Katanga Canyon pathway was open for the entire weekend, but the real treat for rollercoaster enthusiasts was after the fireworks shows each evening when the service road was opened up, giving us all our first chance to walk underneath the Secret Weapon 8 lift hill and really get up close with the new wooden coaster. 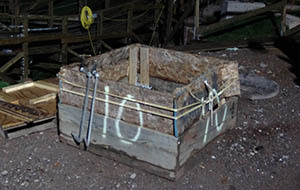 What is inside box 10? 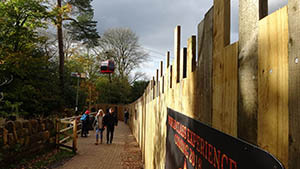 The Katanga Canyon path is now being opened from around 4:30pm for the rest of Scarefest, offering a new set of views across the site and the first opportunities to get up close to SW8's maintenance buildings. 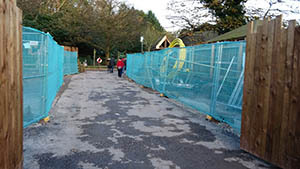 The path is also expected to be open next weekend during the evenings of the Fireworks event. 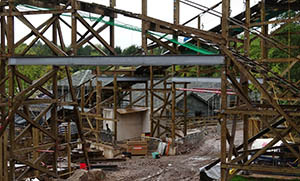 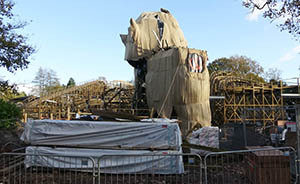 The theming element under cover ... could this be the Wicker Man? 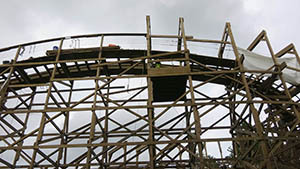 The track runs through the legs of the ... wicker man? 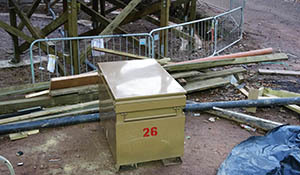 What is inside box 26? 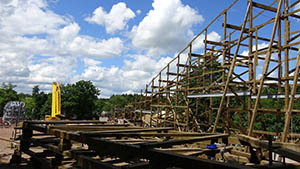 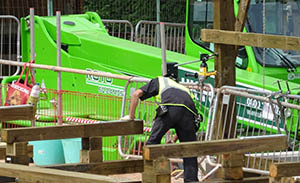 Lots of builders on site today, spread across the site working on various parts of the track. 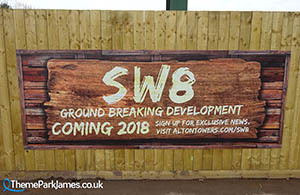 New signs have been put up around the boundary fences, revealing the SW8 logo which looks like a burning man. 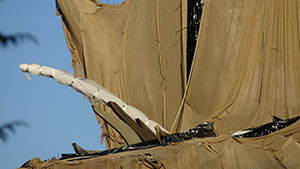 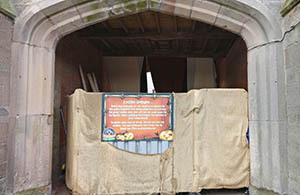 Could this be another clue to the true purpose of the large theming element, now shielded from view underneath hessian sack material? 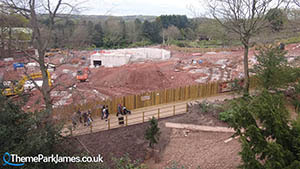 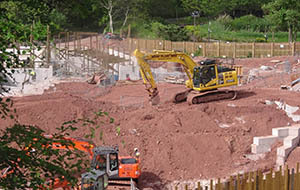 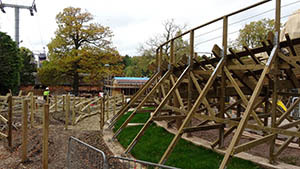 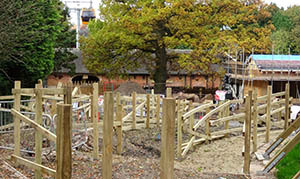 The queueline paths and fences are progressing next to the bottom turn around, which follows the circle footprint of The Flume's old station. 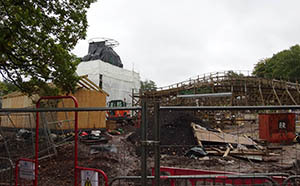 In an early version of the plans for SW8 there was to be a restaurant in the middle, although this was ultimately not progressed. 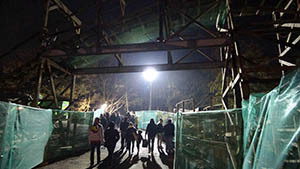 Elsewhere on the park Scarefest has begun, featuring The Welcoming: Be Chosen scare maze which acts as a preview to the backstory of SW8. 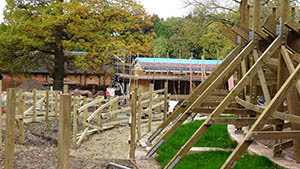 The maze features a group of woodland dwellers who shy away from modern technology. 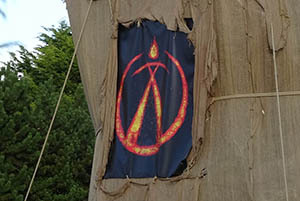 The group have invited outsiders to participate in a strange ritual, with the opportunity to "be chosen" ... whether or not that is something good or bad is only revealed to those brave enough to enter the maze and find out for themselves. 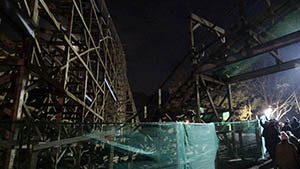 A huge amount of trackwork is now in place, and the ride's layout is clearly visible. 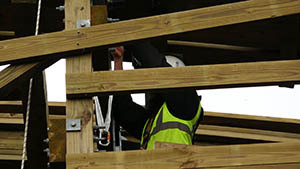 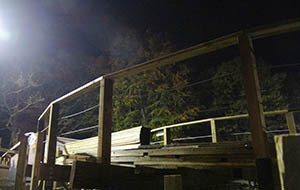 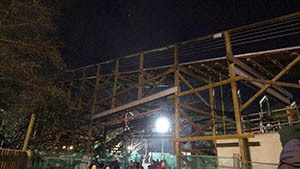 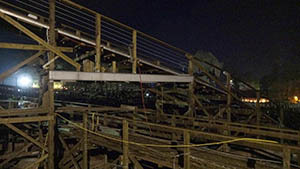 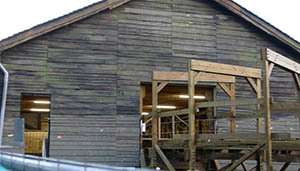 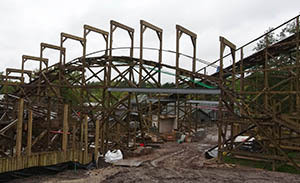 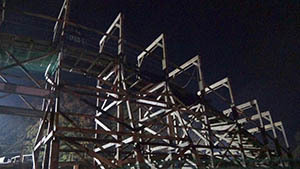 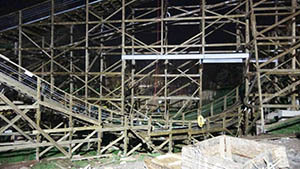 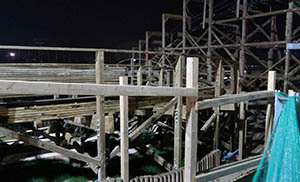 Layers of wood are being built up, which will eventually be topped with the rollercoaster's metal running rails. 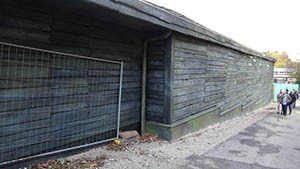 The station and maintenance buildings have been cladded in dark grey and are now partially obstructed from view by parts of the track. 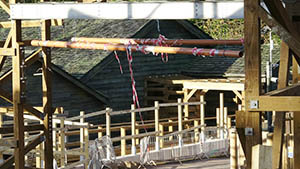 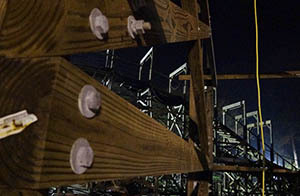 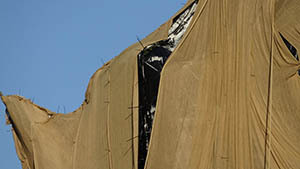 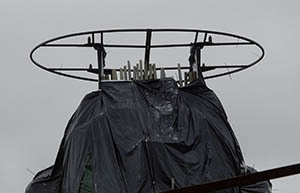 The major theming element has doubled in height and is has been covered over to hide whatever work is going on to it at this point, although there are some grey wooden-like spikes protruding from the top of the structure. 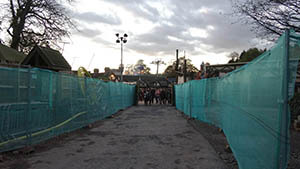 Across from the main construction site, The Welcoming: Be Chosen scare maze is being built within the Mutiny Bay Courtyard ready for Scarefest. 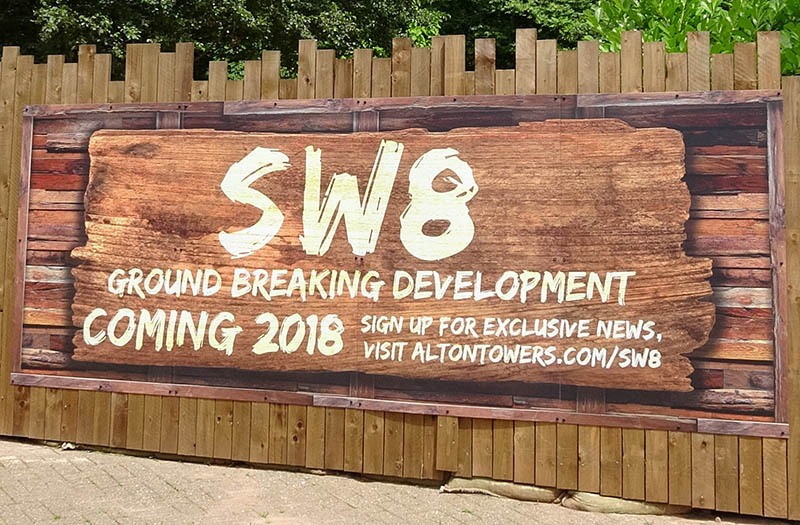 The maze is somehow linked to SW8, possibly in a similar way that The Sanctuary maze related to The Smiler backstory at Scarefest in 2012. 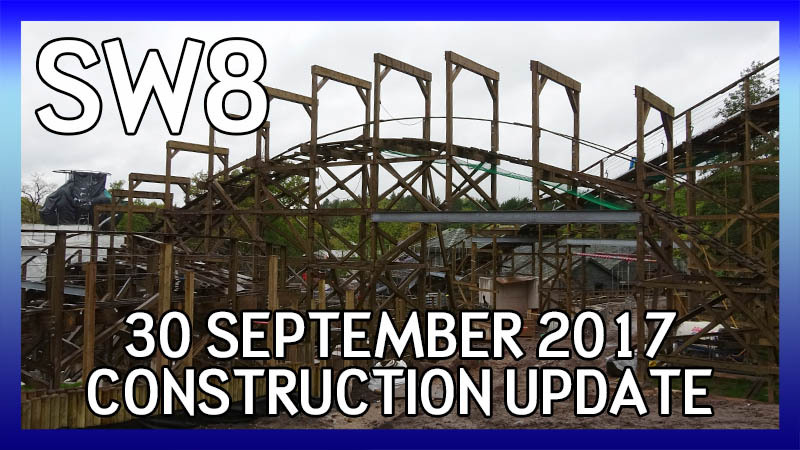 There have been massive changes on the site over the last four weeks. 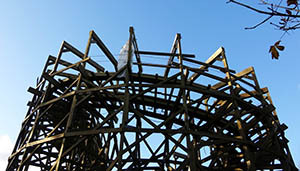 Most notably, the framework of the wooden lift hill now dominates the skyline. 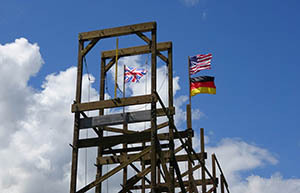 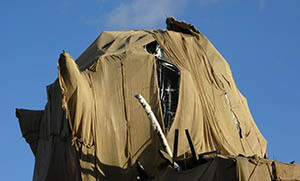 It was topped of on Friday, and has German, American and British flags flying from the top. 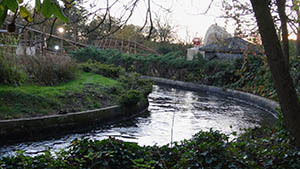 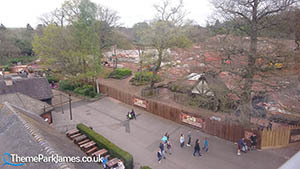 This is clearly visible from several places around the park, including Mutiny Bay and the Congo River Rapids queueline. 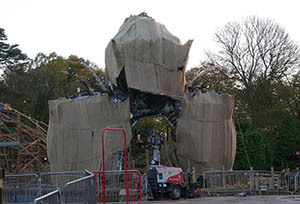 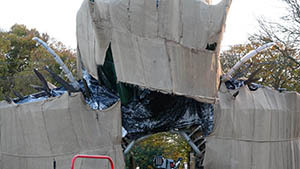 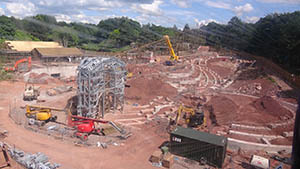 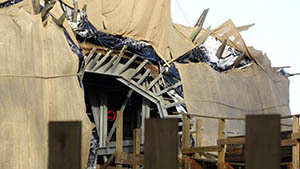 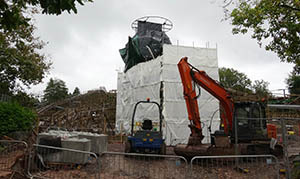 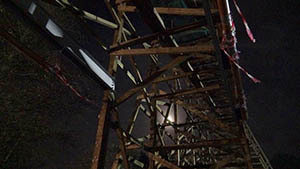 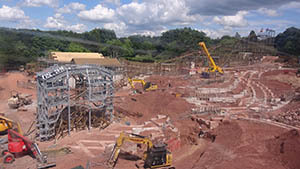 A large metal structure has also been erected down on the lower half of the site, which many believe to be the bottom of a giant Wicker Man statue which the ride will eventually pass underneath. 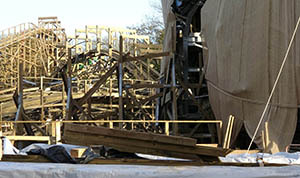 Indeed, the track sections under its "legs" are already being constructed. 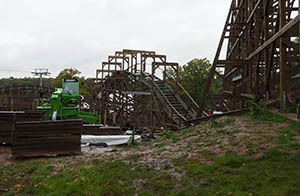 It will be interesting to see how much more of this gets built before an announcement/confirmation of the ride theme is made. 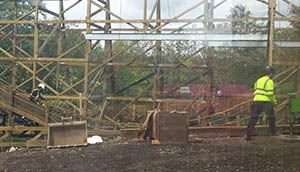 The station and maintenance buildings are also looking much more complete. 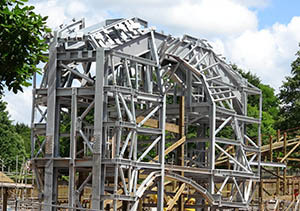 These now both have the majority of their roofs in place. 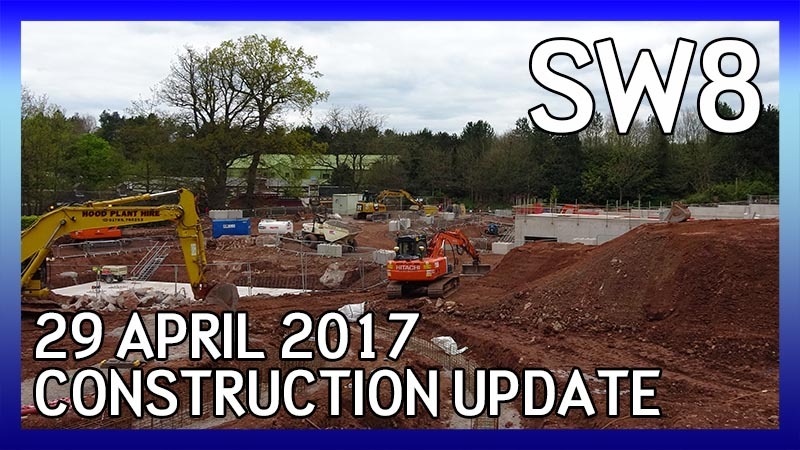 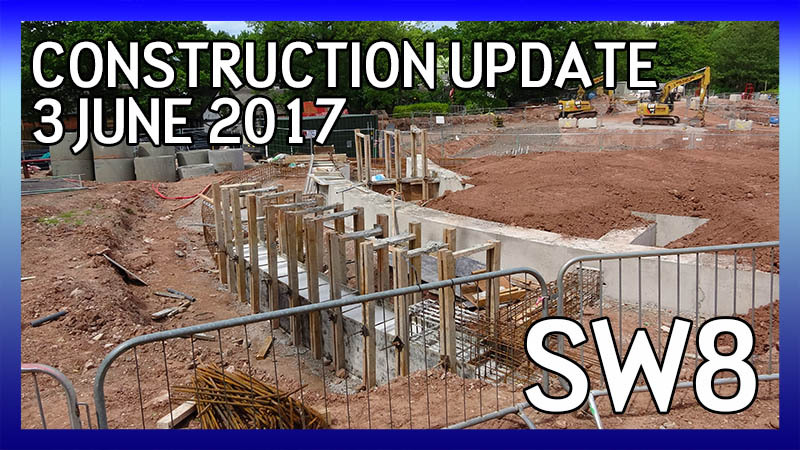 Construction on the SW8 site has been progressing nicely over the last month. 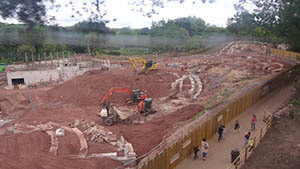 It is now much clearer from looking at the site where certain sections of the track layout will be, and there is a preliminary scattering track supports visible. 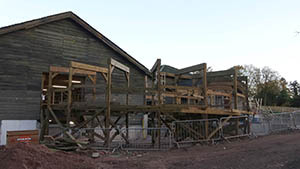 However, the most obvious change is over at the station building. 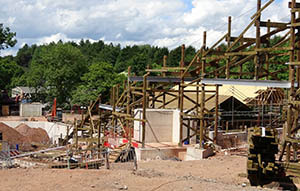 The framework for the building has gone vertical and the station, together with the maintenance building is starting to take shape. 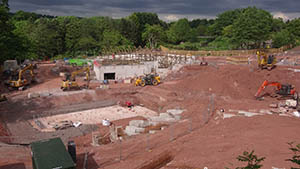 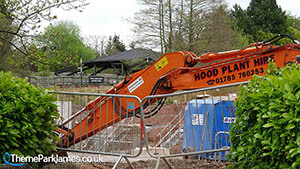 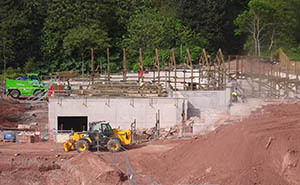 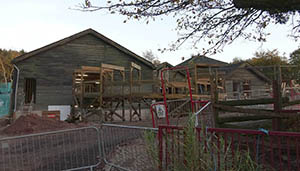 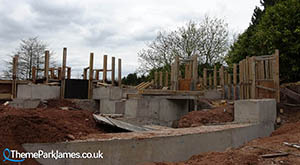 The former home of The Flume is now very much a building site. 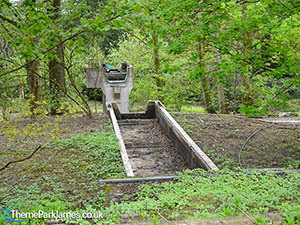 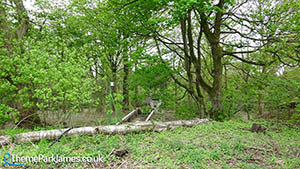 All that remains of the old log flume is the station building and some of the concrete supports in the surrounding woodland. 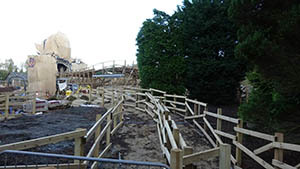 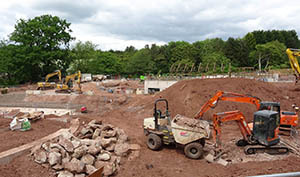 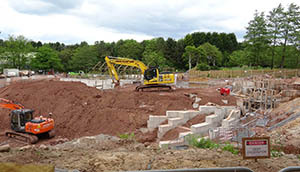 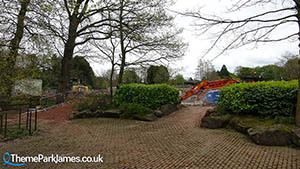 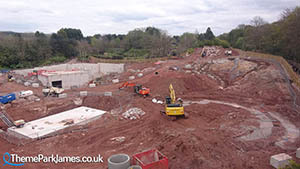 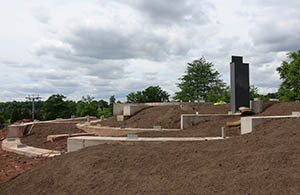 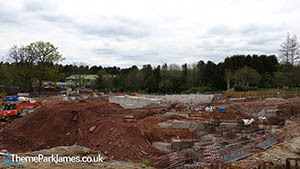 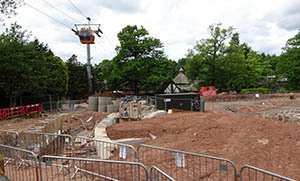 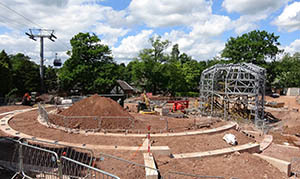 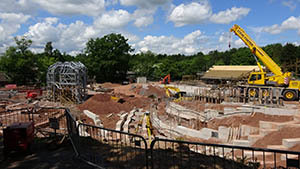 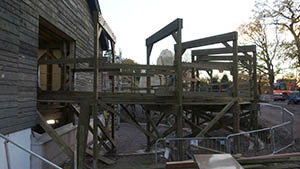 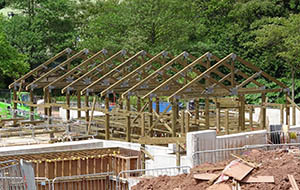 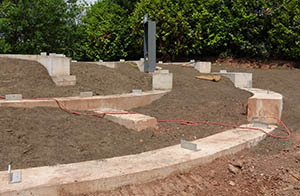 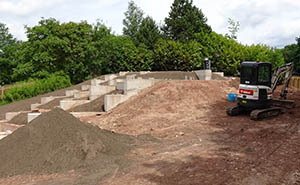 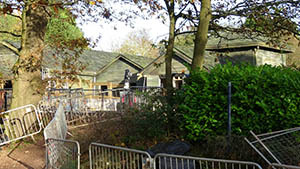 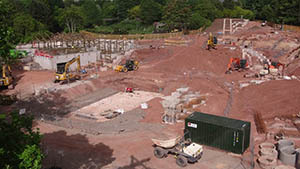 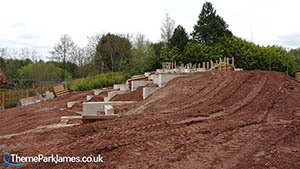 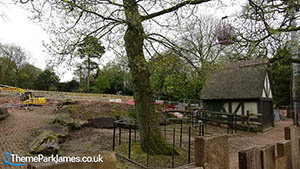 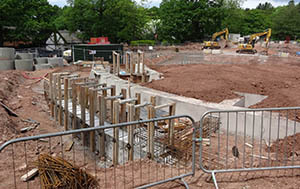 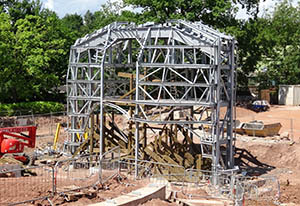 Extensive groundworks have taken place, and construction of the new coaster's main building has started. 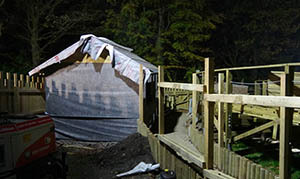 The usual path between Mutiny Bay and Katanga Canyon has been closed for the 2017 season to allow easy access to the site for construction traffic. 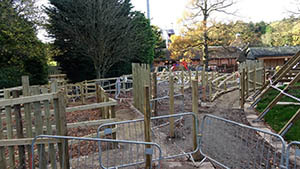 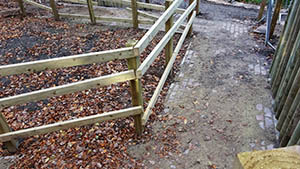 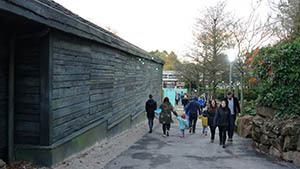 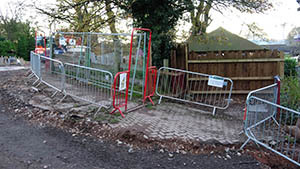 In its place at a cost of £100k, the backstage path between the two areas, only usually open on Fireworks nights, has been opened with a short length of new path which skirts the southern side of the SW8 site.